Escherichia coli is one of the most important microorganisms in biotechnology and well known for its high capacity to overproduce primary metabolites such as amino acids. Here, we explore the potential of E. coli to produce complex substances of secondary metabolism that are of great interest to the pharmaceutical industry. Supported by the DAAD and the Max-Buchner Foundation of the Dechema, we create customized production strains for violacein and deoxyviolacein. These substances are naturally produced by bacteria and exhibit analgesic, antipyretic, antibiotic, anti-viral and anti-tumor properties. Beyond heterologous expression of the violacein operon in E. coli, we use systems metabolic engineering to increase the supply of precursor molecules, reducing power and energy through global pathway engineering. 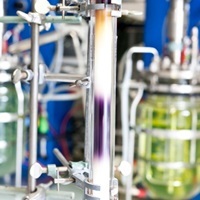 For the producing strains, appropriate bioprocesses and purification strategies should be developed, in order to obtain the valuable molecules in pure form in the gram range. Rodrigues AL, Göcke Y, Bolten CJ, Brock NL, Dickschat JS, Wittmann C (2012) Microbial production of the drugs violacein and deoxyviolacein – analytical development and strain comparison. Biotechnol. Lett. 34:717-720. Link. Rodrigues AL, Trachtmann N, Becker J, Blotenberg J, Lohanatha A, Bolten CJ, Korneli C, de Souza Lima A, Porto L, Sprenger G, Wittmann C (2013) Systems metabolic engineering of Escherichia coli for production of the antitumor drugs violacein and deoxyviolacein. Metab. Eng. 20:29-41. Link. Rodrigues AL, Becker J, de Souza Lima AO, Porto LM, Wittmann C (2014) Systems metabolic engineering of Escherichia coli for gram scale production of the antitumor drug deoxyviolacein from glycerol. Bioetchnol. Bioeng. In press. Link.